I’m having a really bad day today, my back is playing up in a really bad way. It’s been painful since Christmas, just gradually getting worse but these past 2 days it’s been really bad. It was difficult to go to sleep last night, I just couldn’t find a comfortable position to lie in. I then woke up about 3:30am this morning and tried to get up to stop the pain but couldn’t. Hubby spent the next 2 hours trying to get me out of bed – twice he wanted to call an ambulance but I wouldn’t let him. The pain is really bad but I’m terrified of hospitals, I think there is always that feeling that you’re bothering them too, I kept thinking it’s only a bad back. Eventually I got up, by this time it was half five and I was worn out. I’m just waiting for the doctor to phone me back now, hopefully I’ll be able to get some stronger pain killers. I can’t put any weight on my legs though so I’m stuck here in this chair with nothing to do but surf the net. 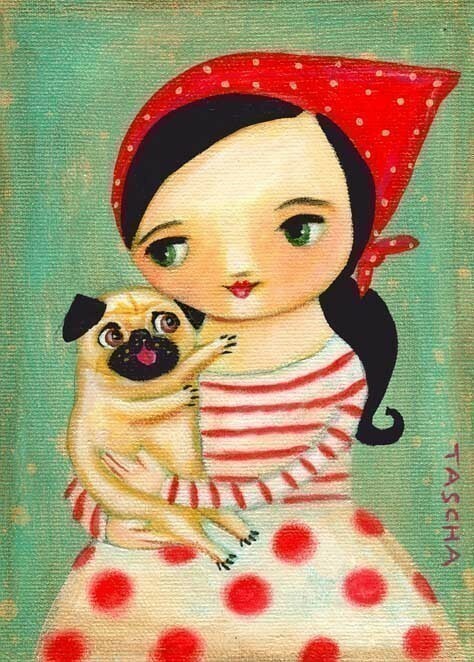 This is by the wonderfully talented Tascha and it really managed to put a smile on my face today!